The RealPad tablet is aimed at users who are 50 and older, the age range for AARP membership, and shy of technology. Simplicity is key: The tablet provides quick access to email, Web sites, social networks, multimedia and ebooks through a user interface with large icons. “Now there’s no excuse for not having a tablet. RealPad makes it easy to connect, share and learn,” the RealPad website proclaims. 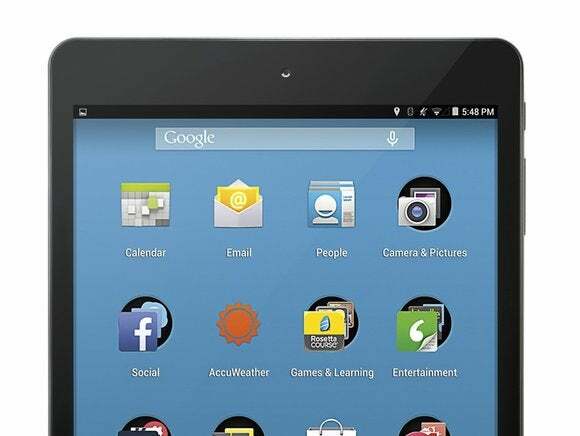 The tablet, which has a 7.85-inch screen and is based on the Android OS, will sell for $189 starting in mid-October through Walmart’s website. Popular tablets like Apple’s iPad and Samsung’s Galaxy Tab are being used by toddlers and older people alike. But the RealPad has some features that could make it attractive for technology neophytes. The user interface has large icons for one-click access to email, social networks, weather, news, games, entertainment, camera and pictures, and Google’s search engine. A bar at the bottom of the screen has icons for AARP, the Web, apps and tablet-fixing tools. A specific icon connects users to technology support agents over the Internet who can access the tablet and fix problems. There are also icons to access Google Play and advanced tools. The tablet weighs 396 grams—heavier than the 331-gram iPad Mini, which also has a 7.85-inch diagonal screen. The RealPad has a 2-megapixel front camera and 5-megapixel rear camera, Wi-Fi, Bluetooth 4.0, 16GB of storage and a micro-SD slot for expandable storage. It runs on Intel’s older dual-core Z2520 processor. Intel’s trying to expand its presence in the tablet market through devices aimed at specific groups of users such as students. Intel Labs have also been researching telemedicine technologies so it’s easier to monitor patients remotely.